The drum A is a piece of wood, 1 3/4 in. long and l 3/16 in. 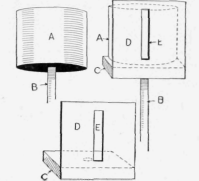 in diameter, supported on the end of a round stick, B, which can be made in one piece with the drum, if a wood lathe is at hand, but a piece cut from a curtain pole and a lead pencil inserted in a hole bored in the end will answer the purpose. Be sure to have the diameter of the drum 1 3/16 inches. Provide a base piece, C, 1/2 in. thick and 2 in. square, and fasten a piece of cardboard having a slit E, as shown. The cardboard should be 2 in. wide and 2 1/2in. high, the slit being cut 1/2 in. in width, 1/4in. from the top and 3/4in. from the bottom. A hole is bored in the center of the block to admit the standard B easily. The next step is to provide the picture and attach it to the drum. A picture of a boy pounding cobblestones is shown in the sketch, at F, which should be made on a strip of paper 4% in. long. This is glued or attached with rubber bands to the drum. The drawing can be enlarged in pen and ink, or can be reproduced as it is, if a hand camera is at hand, and a print used on the drum. It is only necessary to put the parts together, grasp the base in one hand and turn the support B with the other, when, looking through the slot E, the boy is seen pounding the stones. Various pictures can be made and the strips changed. - Contributed by C. C. Fraser, Saginaw, Mich.